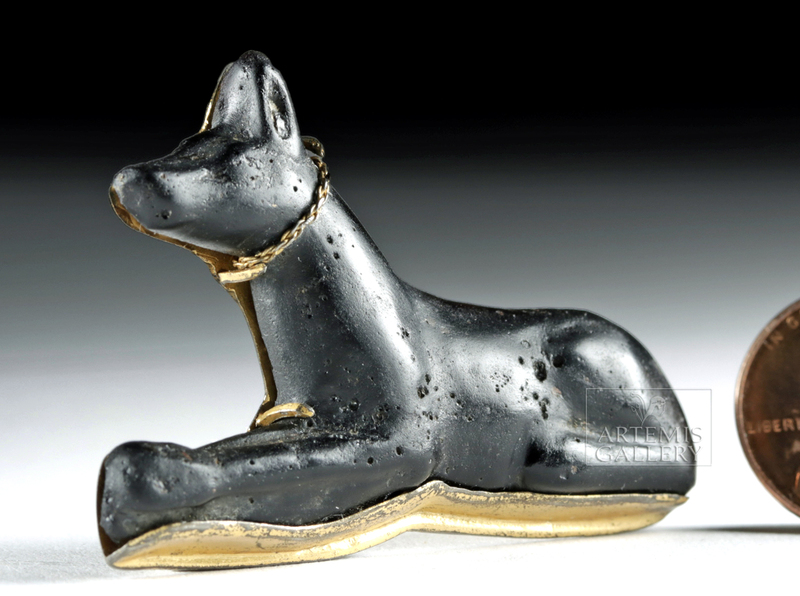 Anubis, based on the real animal called the African golden jackal, is a god associated with mummification and the afterlife and is usually depicted as either a canine or a man with a canine head. 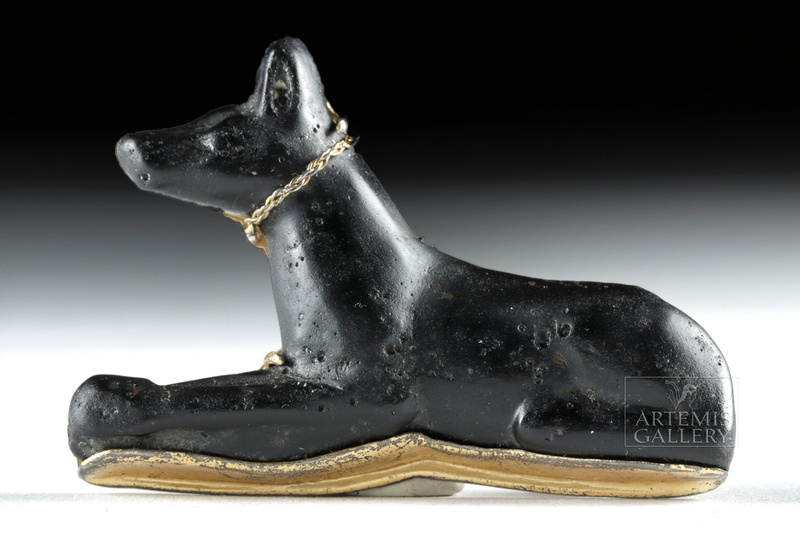 Like many Egyptian deities, the role of Anubis changed over time. During the First Dynasty, he was a protector of graves and an embalmer. In the Middle Kingdom period, Osiris claimed Anubis' role as lord of the underworld, but Anubis continued to weigh the hearts of the dead against a feather to determine if they were deserving of eternal life. Anubis is also associated with Wepwawet (Upuaut), an Egyptian god based on the African golden wolf, with grey or white fur in contrast to that of Anubis. 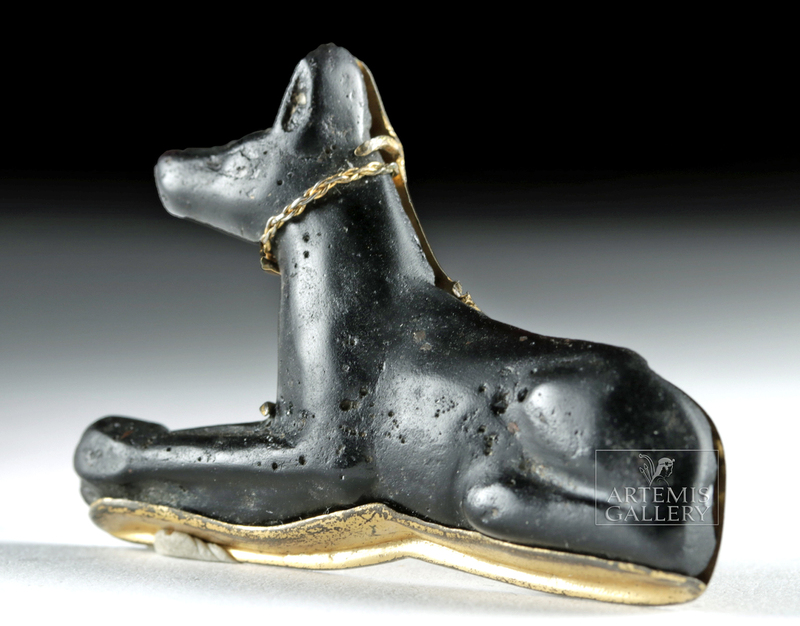 Together, they were worshipped at the city of Asyut which was called "Lycopolis" (city of wolves) by the Greeks. In 1895, American traveler William Vaughn Tupper described Asyut: "In the hills seen on the horizon are the tombs of the priests and numberless holes in the rocks once filled with mummies of the Jackal … the hills are now strewn with skulls and bones of the Jackals" (from the William Vaughn Tupper Scrapbook Collection, Boston Public Library). Cf. Flinders-Petrie, Egyptian Amulets, pl. XXXIX, 231g. Condition: Jackal amulet is Late Dynastic. Gold tone brooch pin plate dates to 20th century. Loss to tail, shows very light wear and a couple spots of reddish deposit present on glass, otherwise intact and excellent. 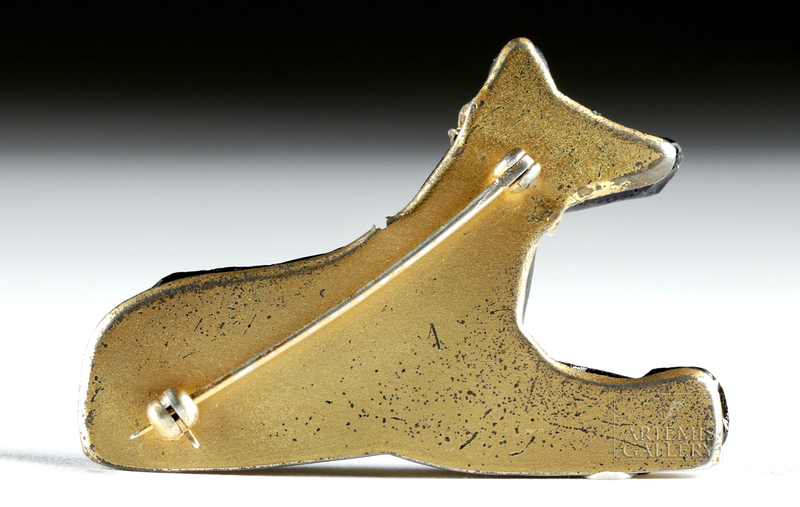 Surface wear to the gold tone brooch plate as shown.